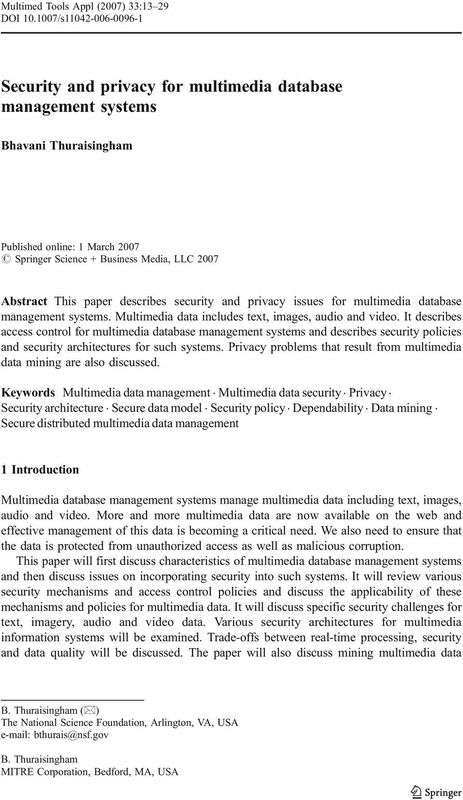 Download "Security and privacy for multimedia database management systems"
3 Multimed Tools Appl (2007) 33: database management system. That is, a DBMS together with an extension layer provide complete support to manage multimedia data. In the alternative case, both the extensions and the database management functions are integrated so that there is one database management system to manage multimedia objects as well as the relationships between the objects. Multimedia databases could also be distributed. In this case, we assume that each MM- DBMS is augmented with a Multimedia Distributed Processor (MDP) as discussed in . In representing multimedia data, several features have to be supported. First of all, there has to be a way to capture the complex data types and all the relationships between the data. Various temporal constructs such as play-before, play-after, play-together, etc., have to be captured (see, for example, the discussion in ). An appropriate data model is critical to represent an MM-DBMS. 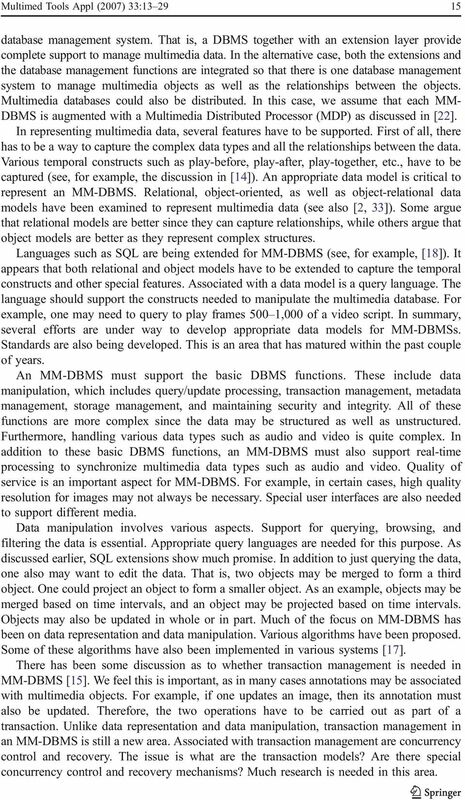 Relational, object-oriented, as well as object-relational data models have been examined to represent multimedia data (see also [2, 33]). Some argue that relational models are better since they can capture relationships, while others argue that object models are better as they represent complex structures. Languages such as SQL are being extended for MM-DBMS (see, for example, ). It appears that both relational and object models have to be extended to capture the temporal constructs and other special features. Associated with a data model is a query language. The language should support the constructs needed to manipulate the multimedia database. For example, one may need to query to play frames 500 1,000 of a video script. In summary, several efforts are under way to develop appropriate data models for MM-DBMSs. Standards are also being developed. This is an area that has matured within the past couple of years. An MM-DBMS must support the basic DBMS functions. These include data manipulation, which includes query/update processing, transaction management, metadata management, storage management, and maintaining security and integrity. All of these functions are more complex since the data may be structured as well as unstructured. Furthermore, handling various data types such as audio and video is quite complex. In addition to these basic DBMS functions, an MM-DBMS must also support real-time processing to synchronize multimedia data types such as audio and video. Quality of service is an important aspect for MM-DBMS. For example, in certain cases, high quality resolution for images may not always be necessary. Special user interfaces are also needed to support different media. Data manipulation involves various aspects. Support for querying, browsing, and filtering the data is essential. Appropriate query languages are needed for this purpose. As discussed earlier, SQL extensions show much promise. In addition to just querying the data, one also may want to edit the data. That is, two objects may be merged to form a third object. One could project an object to form a smaller object. As an example, objects may be merged based on time intervals, and an object may be projected based on time intervals. Objects may also be updated in whole or in part. Much of the focus on MM-DBMS has been on data representation and data manipulation. Various algorithms have been proposed. Some of these algorithms have also been implemented in various systems . There has been some discussion as to whether transaction management is needed in MM-DBMS . We feel this is important, as in many cases annotations may be associated with multimedia objects. For example, if one updates an image, then its annotation must also be updated. Therefore, the two operations have to be carried out as part of a transaction. Unlike data representation and data manipulation, transaction management in an MM-DBMS is still a new area. Associated with transaction management are concurrency control and recovery. The issue is what are the transaction models? Are there special concurrency control and recovery mechanisms? Much research is needed in this area. 6 18 Multimed Tools Appl (2007) 33:13 29 management system are secure. These include the communication subsystem and operating system as well as the middleware. Note that to have a completely secure multimedia information system we need secure multimedia database management systems, secure multimedia information management systems, secure networks, secure operating systems, secure middleware and secure applications. That is, we need end-to-end security. We need to ensure that each component of the integrated system is secure. 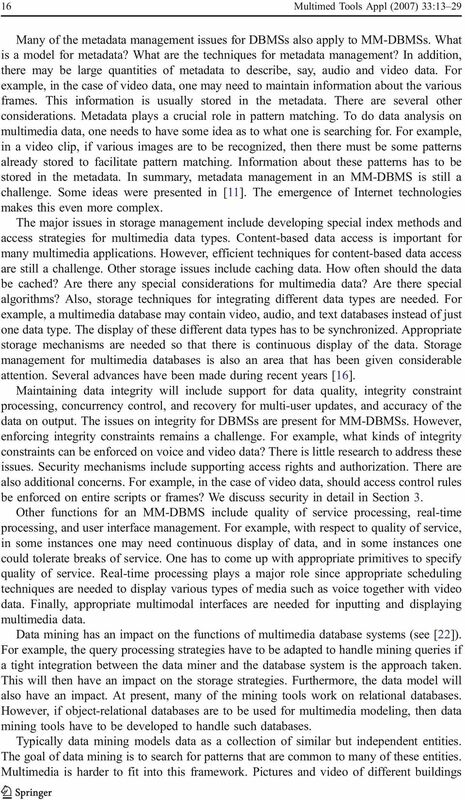 In this paper we will focus only on securing the Multimedia Data Manager component of the integrated system. 3.2 Security policy Security policy essentially specifies the application specific security rules and application independent security rules. Application independent security rules would be rules such as The combination of data from two video streams is always sensitive User operating at level L1 cannot read/view data from a text object, image object, audio object or video object classified at level L2 if L2 is a more sensitive level than L1. The second rule above is usually enforced for multilevel security. In a multilevel secure database management system users cleared at different clearance levels access the data assigned different sensitivity levels so that the user only gets the data he or she can access. For example, a user at the Secret level can read all the data at the Secret level or below and a user at the unclassified level can only read the unclassified data. The access control model enforced for multilevel secure database systems is the Bell and La Padula model. In this model a user can read data at or below his level and he can update data at or above his level. Database security researchers have strengthened the second rule and most database systems enforce a rule where a user updates data at his level (see ). Now the main question is how does the policy apply for multimedia data? We could have video cameras operating at different levels. Video cameras operating in the Middle East may be highly classified while video cameras in Europe may be less classified. Classified instruments will gather classified data while unclassified instruments will gather unclassified data. Furthermore video data may be in the form of streams. Therefore we need access control policies for data streams. Within each level, one could enforce application specific rules. Application specific security rules include the following: Only law enforcement officials have authorization to examine video streams emanating from video camera A. Data from video streams A and B taken together are sensitive. All the data emanating from video cameras in Washington DC federal buildings are sensitive while the data emanating from video cameras in North Dakota federal buildings are not sensitive. Essentially applications specific rules are specified using security constraints. We discuss security constraint processing in a later section. Note that in addition to video streams the discussion also applies for document sources, audiotapes and image data. Another question is do the multimedia data collection instruments at different levels communicate with each other? Now, if the Bell and LaPadula policy is to be enforced, a classified instrument cannot send any data to an unclassified instrument. Data can move in the opposite direction. The multimedia network must ensure such communication. 9 Multimed Tools Appl (2007) 33: examines the access control rules and computes the level of the multimedia data to be inserted or modified. Security also has an impact on multimedia editing and browsing. When one is browsing multimedia data, the system must ensure that the user has the proper access to browse the link or access the data associated with the link. In the case of multimedia editing, when objects at different levels are combined to form a film, then the film object has to be classified accordingly. One may need to classify the various frames or assign the high water mark associated with the levels of the individual objects that compose the film. Furthermore, when films are edited such as certain portions are deleted, and then one needs to recompute the level of the object. Secure multimedia transaction processing is another issue. First, what does transactionprocessing mean? One could imagine data being gathered from two different locations (e.g. video streams) and make simultaneous updates to the multimedia database. Both updates have to be carried out as a transaction. This is conceivable if say an analyst needs both films to carry out the analysis. So assuming that the notion of a transaction is valid, what does it mean to process transactions securely? There has been a lot of work on secure transaction processing both for single level and multi-level transactions. In the case of a single level transaction it is assumed that the transaction is processed at a single security level. In the case of multilevel transactions, the transaction may operate at multiple security levels. The main challenge is to ensure that information does not flow covertly from a higher level to a lower level. Multimedia transaction processing will also have similar challenges. We need to examine the techniques from secure transaction processing and real-time transaction processing to see if we can develop techniques specific to dependable multimedia transaction processing. Next consider the storage manager function. The storage manager has to ensure that access is controlled to the multimedia database. Storage manager may also be responsible for partitioning the data according to the security levels. The security impact of access methods and indexing strategy for multimedia data are yet to be determined. Numerous index strategies have been developed for multimedia data including for text, images, audio and video. We need to examine the strategies and determine the security impact. Metadata management is also another issue. For example, we need to first determine the types of metadata for multimedia data. Metadata may include descriptions about the data, the source of the data as well as the quality of the data. Metadata may also include information such as Frames 100 2,000 are about president s speech. Metadata may also be classified. In some cases the metadata may be classified at a higher level than the data itself. For example, the location of the data may be highly sensitive while the data could be unclassified. We should, also ensure that one cannot obtain unauthorized information from the metadata. 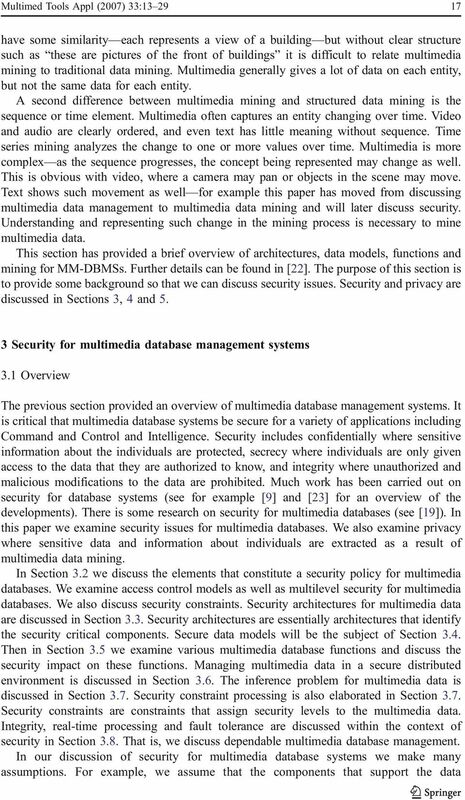 3.6 Secure distributed multimedia data management As we have stated in this paper, there may be multiple multimedia databases connected throughout the network. Some of the databases may contain single media data such as text; images, video or audio and some others may contain multimedia data. Some of them may be unstructured while some other may be semi-structured. There is also a need to connect multimedia data with relational and structured data. The collection of multimedia databases functions like a distributed database management system. Therefore, ensuring security for such a network is in many ways like ensuring security for distributed database management systems. 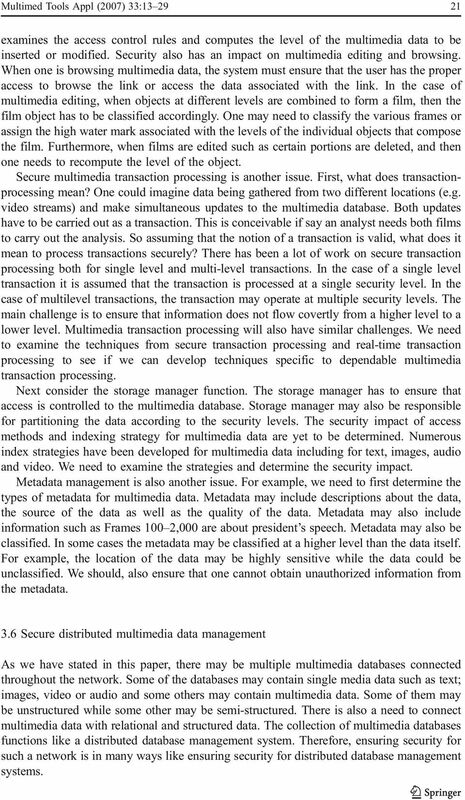 10 22 Multimed Tools Appl (2007) 33:13 29 The distributed architecture we have discussed in the previous section is one such architecture that could be employed for a secure distributed multimedia data manager. That is, data is partitioned according to security levels and managed by a trusted agent. We may also want to connect several multimedia data managers each based on one of the architectures we have discussed in the previous section. That is, we can build a true secure distributed multimedia data manger by connecting the different secure multimedia data managers. We assume that the multimedia communication network that connects the multimedia data managers is secure. We have to ensure that when the different multimedia data managers are connected no higher-level information is sent to a lower level multimedia data manager. That is, we could assume that at each site there could be an instance of a multimedia data manager operating at level L communicating with another multimedia data manager also operating at level L. Another challenge is to enforce distributed access control. Each multimedia node would have its own security policy. We need to form an integrated policy. The integrated policy has to be enforced across all the multimedia nodes. The aggregation problem is exacerbated as the multimedia data managers process data and the processed data may have to be aggregated across the data managers. The aggregated data may be highly sensitive. We discuss the inference problem in the next section. 3.7 Inference problem Inference is the process of users or subjects deducing information from the legitimate responses received. If the deduced information is something that the user is not allowed to see then it becomes a problem. This is known as the inference problem. Various approaches have been proposed to handle the inference problem (see for example, ). One of the promising approaches to the inference problem is security constraint processing where some constraints are processed during database design where the data schemas are partitioned according to the security levels. Some constraints are processed during database updates and the data is assigned appropriate levels. Some constraints are processed during the query operation and the data is prevented from being released to the user. Some examples of security constraints were given in Section 3.2. These are application specific constraints. In a shared data processing environment, because a lot of data has to be aggregated, there could be a potential for inference problems. That is, the aggregated data from multimedia nodes A, B and C could be highly sensitive. For example, one multimedia data manager could be managing video streams emanating from the situation in the Middle East and another multimedia data manager could manage video streams emanating from the situation in Asia and the combined sensed information could be highly sensitive. The inference controller has to examine the constraints and prevent such sensitive information from being released to individuals who are not authorized to acquire this information. While much progress has been made on the inference problem for relational databases, we need to examine the techniques for multimedia databases. However new technologies such as data mining exacerbates the inference problem. That is, because with data mining, users now have tools to make all kinds of inferences some of which may be unauthorized. However we need data mining tools as they solve many security problems such as intrusion detection and auditing. Therefore, we need to develop data mining techniques that will control, some of the unauthorized inferences. We will revisit this topic under privacy in Section 5. 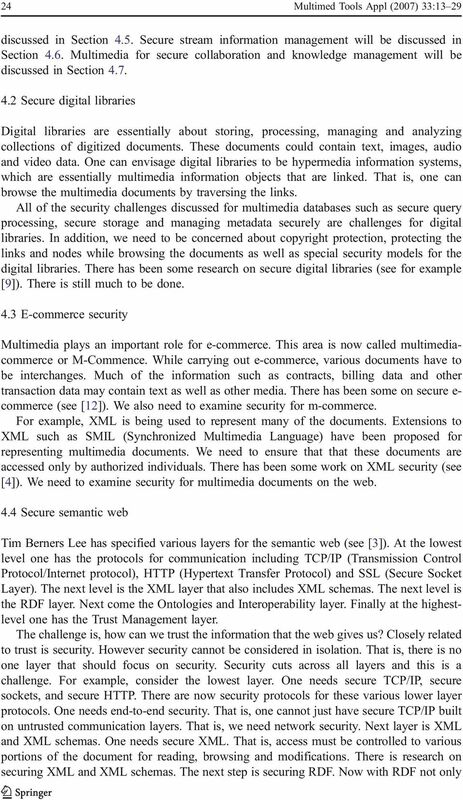 13 Multimed Tools Appl (2007) 33: do we need secure XML, we also need security for the interpretations and semantics. For example under certain context, portions of the document may be Unclassified while under certain other context the document may be Classified. As an example one could declassify an RDF document, once the war is over. Lot of work has been carried out security constraints processing for relational databases. One needs to determine whether these results could be applied for the semantic web (see [5, 30]). Once XML and RDF have been secured the next step is to examine security for ontologies and interoperation. That is, ontologies may have security levels attached to them. Certain parts of the ontologies could be Secret while certain other parts may be Unclassified. The challenge is how does one use these ontologies for secure information integration? Researchers have done some work on the secure interoperability of databases. We need to revisit this research and then determine what else needs to be done so that the information on the web can be managed, integrated and exchanged securely. 4.5 Secure publishing of multimedia documents Whether it is for digital libraries or for semantic web or for m-commerce, we may need to publish multimedia documents on the web. Security is an important consideration for publishing documents. In  some interesting work was reported on secure publishing of XML documents. The idea is for owners to specify access control policies on users and third party publishers to enforce the access control policies when disseminating the documents. Now, if the third party is trusted then no additional work is necessary. However it is almost impossible to trust all of the agents on the web. Therefore the challenge is to use appropriate encryption techniques and ensure that the user only gets the documents he is authorized to get. We need to examine such work for publishing multimedia documents on the web. Publishing XML documents is just the first step. As we have stated, extensions to XML have been proposed for representing multimedia documents. The challenge is how do you publish text, image, audio and video documents securely on the web in the midst of untrusted third parties? We need more research to address these challenges. 4.6 Secure stream information processing Stream information management has received much attention (see ). However little work has been reported on security issues. Stream data is continuous data emanating say from sensors and network devices. Often the data is transient. Stream data management issues include developing appropriate query processing and storage strategies. Security issues for stream information processing were briefly examined in  as part of security for sensor databases. For example, what type of access control can you enforced on streams. What happens when data is aggregated? Another challenge is what happens when malicious programs corrupt the data? For example, some results on computing correct aggregate results from possibly corrupted individual data sources were examined in . There is still lot more research to be done in this area. Inference problem when aggregating streams is also an issue. 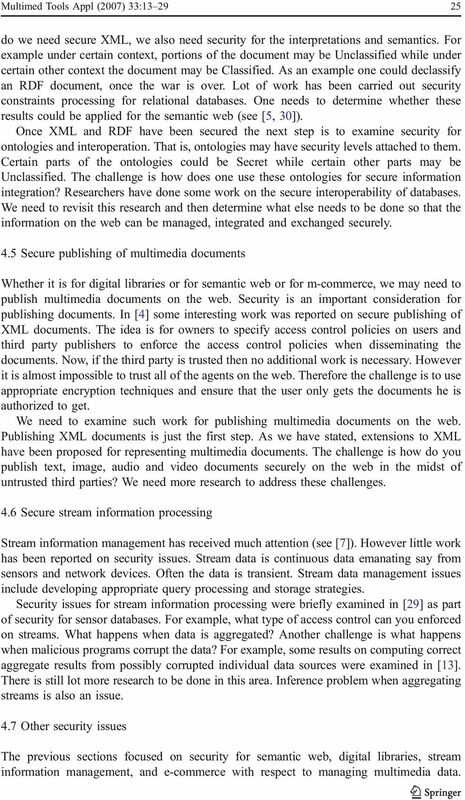 4.7 Other security issues The previous sections focused on security for semantic web, digital libraries, stream information management, and e-commerce with respect to managing multimedia data. 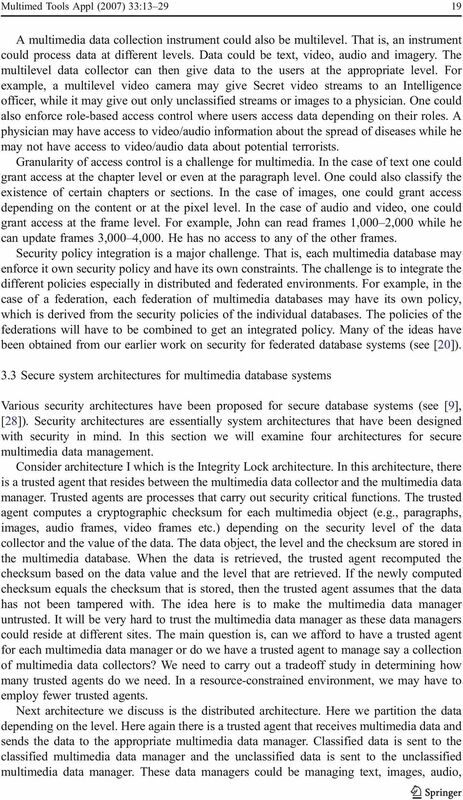 14 26 Multimed Tools Appl (2007) 33:13 29 There are several other security challenges. For example, multiple users may collaborate with each other and may exchange multimedia documents. We need to investigate security issues for multimedia documents used for collaboration. Secure knowledge management is also another challenge for multimedia information management. For example, how do we protect the intellectual property of an organization? The intellectual property may be in the form of video/audio recordings, documents and presentations with animations. How do you securely store and manage this information? Secure knowledge management challenges also include managing multimedia documents on corporate Intranets. There is still a lot of research to be done in this area. 5 Privacy considerations 5.1 Overview Privacy is about protecting information about individuals. Privacy has been discussed a great deal in the past especially when it relates to protecting medical information about patients. Social scientists as well as technologists have been working on privacy issues. However, privacy has received enormous attention during the past year. This is mainly because of counter-terrorism and national security. For example in order to extract information about various individuals and perhaps prevent and/or detect potential terrorist attacks data mining tools are being examined. We have heard a lot about national security vs. privacy in the media. This is mainly due to the fact that people are now realizing that to handle terrorism, the government may need to collect data about individuals and mine the data to extract information. Data may be relational or it may be text, video and images. This is causing a major concern with various civil liberties unions (see [24, 27]). In this section we discuss privacy threats that arise due to data mining and multimedia data mining. We also discuss some solutions. Section 5.2 will discuss issues on multimedia data mining, national security and privacy. Some potential solutions are discussed in Section Multimedia data mining, national security and privacy With the world wide web, there is now an abundance of data information about individuals that one can obtain within seconds. The data could be structured data or could be multimedia data such as text, images, video and audio. Information could be obtained through mining or just from information retrieval. Therefore, one needs to enforce controls on databases including multimedia databases and data mining and multimedia data mining tools. This is a very difficult problem especially with respect to multimedia data mining. In summary, one needs to develop techniques to prevent users from mining and extracting information from the multimedia data whether they are on the web or on servers. Now this goes against all that we have said about data mining in our previous papers (see for example, ). That is, we have portrayed data mining as a technology that is critical for say analysts and other users so that they can get the right information at the right time. Furthermore, they can also extract patterns previously unknown. This is all true. However, we do not want the information to be used in an incorrect manner. For example, based on information about a person, an insurance company could deny insurance or a loan agency could deny loans. In many cases these denials may not be legitimate. Therefore, information providers have to be very careful in what they release. Also, data mining and multimedia data mining researchers have to ensure that privacy aspects are addressed. 15 Multimed Tools Appl (2007) 33: While little work has been reported on privacy issues for web and mining, we are moving in the right direction. As research initiatives are started in this area, we can expect some progress to be made. Note that there are also social and political aspects to consider. That is, technologists, sociologists, policy experts, counter-terrorism experts, and legal experts have to work together to develop appropriate data mining and multimedia data mining techniques as well as ensure privacy. 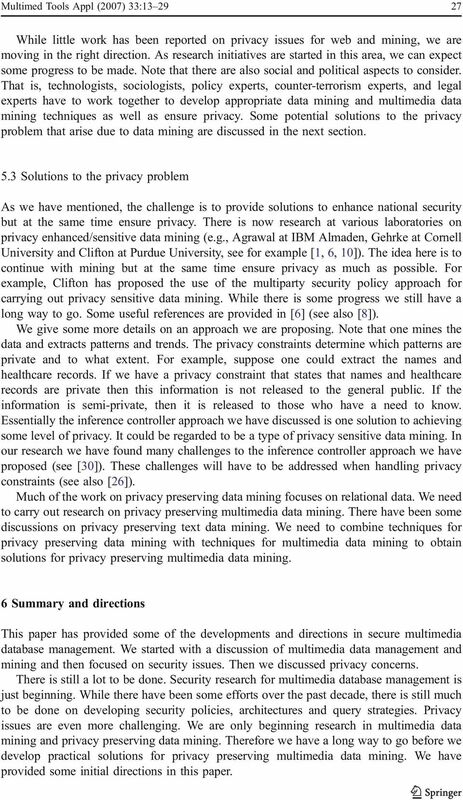 Some potential solutions to the privacy problem that arise due to data mining are discussed in the next section. 5.3 Solutions to the privacy problem As we have mentioned, the challenge is to provide solutions to enhance national security but at the same time ensure privacy. 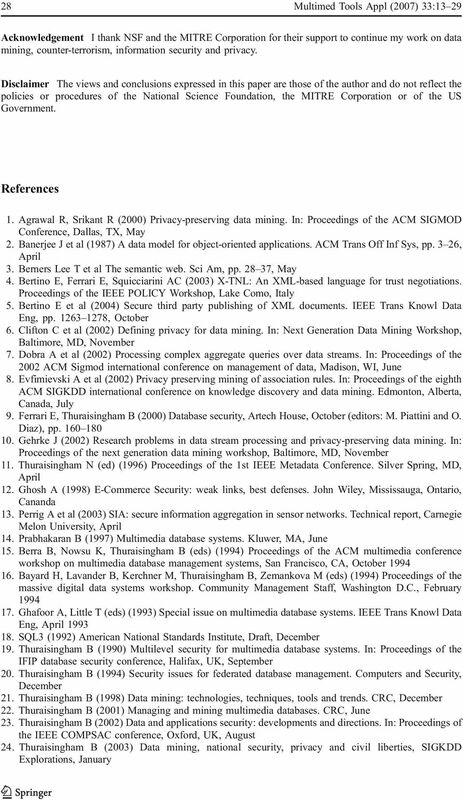 There is now research at various laboratories on privacy enhanced/sensitive data mining (e.g., Agrawal at IBM Almaden, Gehrke at Cornell University and Clifton at Purdue University, see for example [1, 6, 10]). The idea here is to continue with mining but at the same time ensure privacy as much as possible. For example, Clifton has proposed the use of the multiparty security policy approach for carrying out privacy sensitive data mining. While there is some progress we still have a long way to go. Some useful references are provided in  (see also ). We give some more details on an approach we are proposing. Note that one mines the data and extracts patterns and trends. The privacy constraints determine which patterns are private and to what extent. For example, suppose one could extract the names and healthcare records. If we have a privacy constraint that states that names and healthcare records are private then this information is not released to the general public. If the information is semi-private, then it is released to those who have a need to know. Essentially the inference controller approach we have discussed is one solution to achieving some level of privacy. It could be regarded to be a type of privacy sensitive data mining. In our research we have found many challenges to the inference controller approach we have proposed (see ). These challenges will have to be addressed when handling privacy constraints (see also ). Much of the work on privacy preserving data mining focuses on relational data. We need to carry out research on privacy preserving multimedia data mining. There have been some discussions on privacy preserving text data mining. We need to combine techniques for privacy preserving data mining with techniques for multimedia data mining to obtain solutions for privacy preserving multimedia data mining. 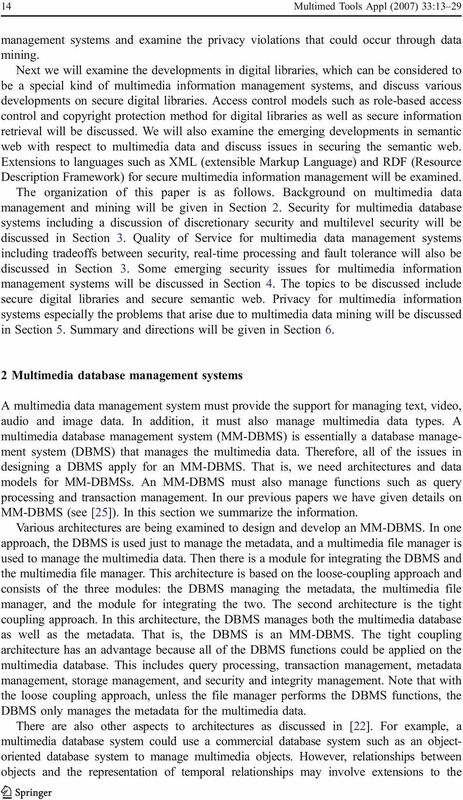 6 Summary and directions This paper has provided some of the developments and directions in secure multimedia database management. We started with a discussion of multimedia data management and mining and then focused on security issues. Then we discussed privacy concerns. There is still a lot to be done. 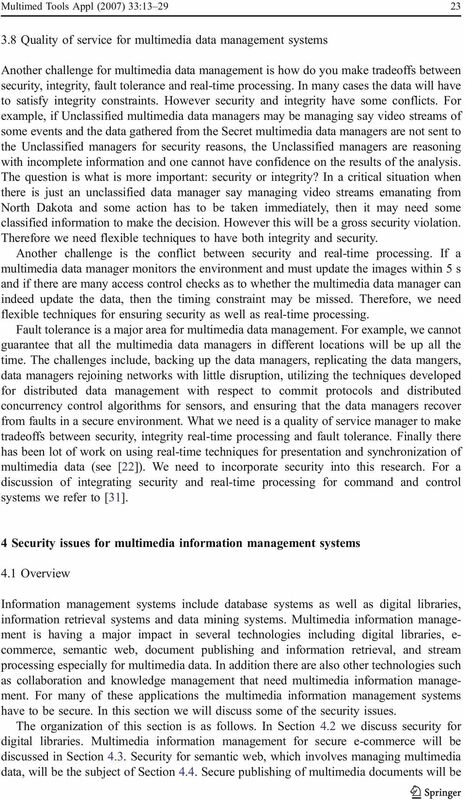 Security research for multimedia database management is just beginning. While there have been some efforts over the past decade, there is still much to be done on developing security policies, architectures and query strategies. Privacy issues are even more challenging. We are only beginning research in multimedia data mining and privacy preserving data mining. Therefore we have a long way to go before we develop practical solutions for privacy preserving multimedia data mining. We have provided some initial directions in this paper. 17 Multimed Tools Appl (2007) 33: Thuraisingham B (2003) Management and mining multimedia databases. International Journal of Tools in Artificial Intelligence, volume 13, September 2004, pp Thuraisingham B (2003) Privacy constraints processing in a privacy enhanced database management system. Data Knowl Eng (in press) 27. Thuraisingham B (2003) Web data mining technologies and their applications to business intelligence and counter-terrorism. CRC, June 28. 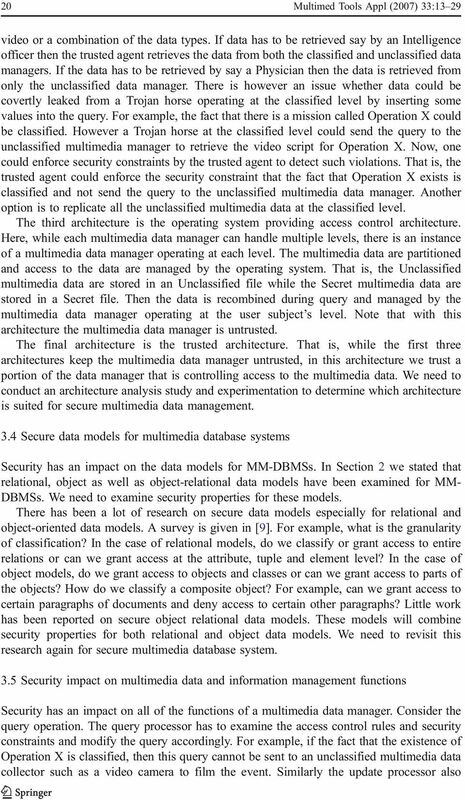 Thuraisingham B (2004) Database and applications security: integrating data management and applications security. CRC, December 29. Thuraisingham B (2005) Secure sensor information management. IEEE Signal Process Mag, pp , May 30. 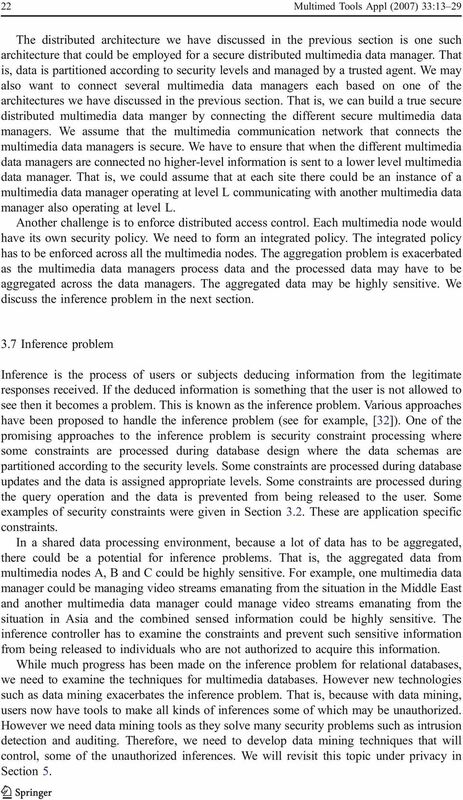 Thuraisingham B, Ford W (1995) Security constraint processing in a distributed database management system. IEEE Trans Knowl Data Eng, pp , April 31. Thuraisingham B, Maurer J (1999) Survivability of real-time command and control systems. IEEE Trans Knowl Data Eng, pp , January 32. Thuraisingham B et al (1993) Design and implementation of a database inference controller. Data Knowl Eng, pp , December 33. Woelk D et al (1986) An object-oriented approach to multimedia databases. In: Proceedings of the ACM SIGMOD conference, Washington DC, June Dr. Bhavani Thuraisingham is the Program Director for Cyber Trust and Data and Applications Security at the National Science Foundation and has been on IPA to NSF from the MITRE Corporation since October She is part of a team at NSF setting directions for cyber security and data mining for counter-terrorism. She has been with MITRE since January 1989 where was the department head in Data and Information Management in the Information Technology Division and later chief scientist in data management in MITRE s Information Technology Directorate. She has conducted research in secure databases for over 18 years and is the recipient of IEEE Computer Society s 1997 Technical Achievement Award and recently IEEE s 2003 Fellow Award for her work in database security. She is also a 2003 Fellow of the American Association for the Advancement of Science. 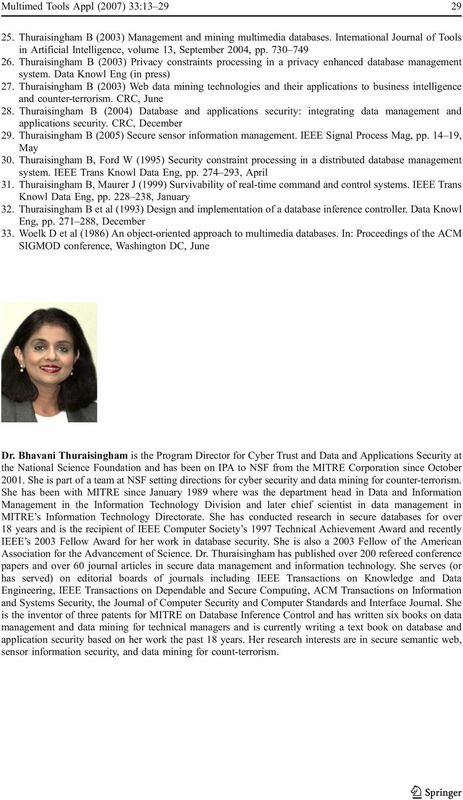 Dr. Thuraisingham has published over 200 refereed conference papers and over 60 journal articles in secure data management and information technology. She serves (or has served) on editorial boards of journals including IEEE Transactions on Knowledge and Data Engineering, IEEE Transactions on Dependable and Secure Computing, ACM Transactions on Information and Systems Security, the Journal of Computer Security and Computer Standards and Interface Journal. She is the inventor of three patents for MITRE on Database Inference Control and has written six books on data management and data mining for technical managers and is currently writing a text book on database and application security based on her work the past 18 years. Her research interests are in secure semantic web, sensor information security, and data mining for count-terrorism. Security and Privacy for Web Databases and Services Elena Ferrari 1 and Bhavani Thuraisingham 2 1 Università dell Insubria, 22100 Como, Italy 2 The National Science Foundation, Arlington, VA, USA Abstract. Database Security. Soon M. Chung Department of Computer Science and Engineering Wright State University schung@cs.wright. The following multiple-choice post-course assessment will evaluate your knowledge of the skills and concepts taught in Internet Business Associate. Introduction to Web Technology 1 (ECS-604) Unit- I Introduction and Web Development Strategies 1. World Wide Web: The World Wide Web is a system of interlinked hypertext documents accessed via the Internet.